It is pretty common when driving on the freeways and highways around Yorba Linda, California to run into road debris. 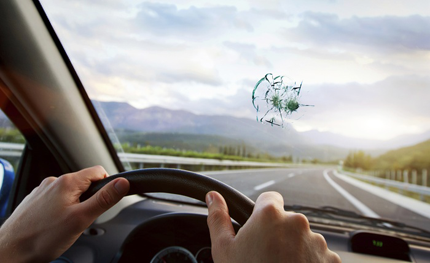 If luck is not on your side, this debris can go airborne and result in damage to your car or truck’s windshield. If this happens to you, finding an established company in the local area such as Express OC Auto Glass to take care of your windshield crack repair needs is a must to avoid more costly repairs later. Our company has been working in the windshield replacement and auto glass repair business for more than ten years, and we serve both visitors and residents throughout the local area to include Anaheim and Fullerton. Although we run into many consumers who incorrectly believe that a windshield repair will take ours, our crack team of certified repair experts are commonly able to repair most windshield cracks and chips in less than an hour. Many times we are having our customer sign the invoice at the 30 minute point depending on the overall extent of damage, and we can also take care of your car window replacement needs in a timely manner. When you first call Express OC Auto Glass to inquire about our windshield chip repair services, our friendly staff will thoroughly review the damage suffered to your automobile with you. Then, we will leverage our more than ten years of working with major insurance companies to see if your auto insurance policy will qualify you for a waiver of the deductible to cover the damages. In many cases, we have been able to save our customers out of pocket money to repair their windshield depending on the full extent of their car insurance. This applies for both for windshield crack repair and other auto glass repair services. Even if we are not successful in this endeavor, our repair prices are some of the best in the industry, and we guarantee that you will be happy with the job that our mobile repair teams do for you. Once our team wraps up their work, you can feel safe in the knowledge that your friends and family who ride in your automobile will be much safer than before in the event you are involved in a car accident. Please give us a call today to see how our team can best serve you. We will always give you a free estimate on our work, so just give us a call when you have time.